ST. LOUIS — Is it too early for desperation from the St. Louis Blues? “I think that we’re still a little bit in a process of realizing, just remembering how hard it is and how desperate you have to play and do things well in order to win hockey games,” Blues coach Mike Yeo told the St. Louis Post-Dispatch. 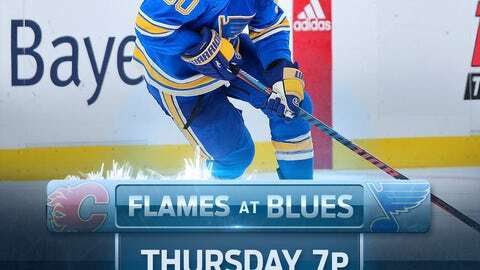 After earning just one point in a disjointed first two games, both on home ice, the Blues hope to find that winning level as they host the Calgary Flames on Thursday night. St. Louis players and coaches have said it will take time to jell after turning over more than half of its top 12 forwards from last season. But they also realize that time is precious in the ultra-competitive Central Division. “Guys that are playing well are going to play and guys that maybe don’t deserve as much ice time aren’t going to get it,” Yeo told the Post-Dispatch. “We’re here to build our team and we have to make sure we’re on top of that. The Blues could get some help on the blue line as veteran defenseman Joel Edmundson is expected to make his season debut against the Flames. Edmundson missed the first two games with a sore groin. The Flames took two out of the three games against the Blues last season, but St. Louis won the only contest played on its home ice. After dropping the season opener, Calgary has won its last two and is coming off a 3-0 win at Nashville on Tuesday. Center Sean Monahan scored twice against the Predators, giving him four goals on the season, and goalie Mike Smith made 43 saves for his 37th career shutout. Calgary is riding hot special teams play. The Flames went 2-for-4 on the power play and killed off all four of the Predators’ man advantages, including a full two minutes on a 5-on-3.